They’re everywhere, and the tech world seems intent on shoving new, smaller, faster, higher quality and ultimately more annoying types down our throat every few months. There are drones with HD cameras, ones that can return to base when the battery is getting low, and others that will follow you around like a wasp, live-streaming your every move to a social media account that nobody’s looking at. Of course, they’ve caused quite a bit of stir in the media with people arguing that they’re a danger to our very existence seeing as they can float almost unheard and film everything we’re up to. They could, for instance, hover outside an occupied bathroom, exposing the person within, fly above a swarm of people at an event, showing the world who’s there (and indicating some empty homes), or drop on someone’s head when being piloted by the less-than-competent. The detracts from the good they can do, however. When piloted by someone who knows what they’re doing with skill and finesse, they can really show off landscapes and buildings to their best. Yes, it’s one of ours, but it proves a point. See how you don’t have to stop when you reach a wall? Nope, straight over it. The way in which a drone works, but elegantly floating over and around objects gives a totally new look to your hotel photography and pushes this media ever more online. I mean, you can’t do this in a brochure, can you?! But still there are the detractors. 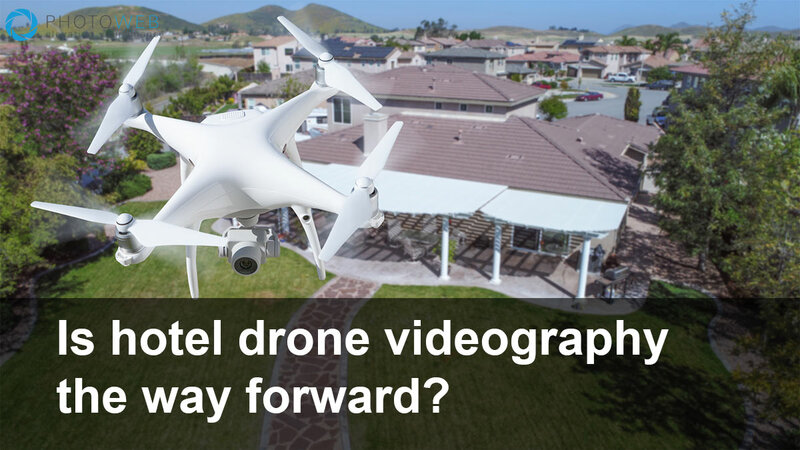 If anything, due to the worry about privacy, drone videography will take a while to become mainstream, which means hotels that adopt it for their websites now will be ahead of the pack. It’s not expensive, yet it gives your customers an unrivalled view of your hotel or resort. It can be even more effective when showing off your activities. For example, if you have a golf course, then show someone taking a swing then follow the ball down the fairway. Near a boating lake? Then get up close and personal to boats right out in the middle of the water, something that would be impossible before drones, unless you had access to a helicopter. Drone videography is in its infancy, and when the amateurs have been cleared out by the legislation and rules that are bound to be tightened, you’ll be able to trust that the company that does yours will provide a professional and safe service.